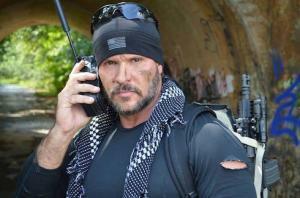 Joseph Teti is a Pittsburgh, Pennsylvania-born American who is a veteran of both US military and US government special operations units, but is perhaps best known for his appearance in the television reality series “Dual Survival” which airs on the Discovery Channel. A well-known personality on television, Joseph has been active in the entertainment industry since 2013 although he was actively serving in the US military far earlier than that. A veteran who showcases his ability to survive in the outdoors with his natural and primitive skills on reality television, one may wonder how rich is Joe Teti? As estimated by sources, Joe counts his net worth at an amount of $300,000 as of mid-2016. Joe has managed to amass his wealth basically from the salary he yielded during his service in the US military, and from his appearance in the reality television show. Joe started his career in the US Marine Corps when he was only eighteen years old and was just freshly out of high school. When he was in high school, he was not much of an athlete, and did not even play any sports. However, Joe went on to start his career in the Marines, serving in the Force Recon during the initial phase of his career, where he was not provided with the best gear available; at the time, the US Marines was not a part of Special Operations Command. Later, Joe continued his career in the US Army Special Forces “Green Berets”. For sure, being a part of the US Marines and U.S Army has managed to add significantly to Joe’s net worth over the years. Joe is also a combat veteran of Operation Iraqi Freedom (OPI) as well as Operation Enduring Freedom (OEF – Afghanistan). During his career as a military man, Joe planned and conducted a broad range of special operations missions in Iraq and Afghanistan, participating in a number of classified direct action missions at the time, while working with Tier 1 Special Mission Units. Later on, he got to show the skills that he had gathered from his career in the US military in the reality show “Dual Survival”. After his retirement from the military, Joe started appearing in the Discovery Channel’s reality series “Dual Survival” in its third season in 2013, in which he starred in the show alongside Cody Lundin, a survival instructor, and later working with Matt Graham. Joe appeared in four seasons of “Dual Survival” from three to six; the sixth season’s last episode was aired on 21 October 2015 and he and co-host Matt Graham have been replaced by the Discovery Channel in what is described as a ‘refreshing move’ for the program. For sure, being a noted name in the television reality show “Dual Survival” added considerably to Joe Teti’s present net worth. A single son to his parents, Joe is believed to be single, but has been enjoying his life as a noted veteran and survivalist. In his spare time, he trains and teaches courses through his training company www.loneoperator.com while his present net worth of $300,000 caters to his daily life.